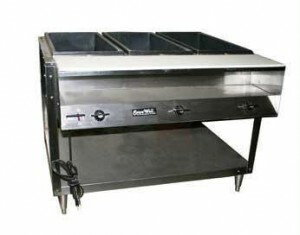 TCI Event Rentals has commercial grade 3, 4, 5 and 6 well steam tables available for rent in the Las Vegas area. Some have the sneeze/cough guard. Our three well steam tables are electric. Larger models are propane gs. On casters for easy mobility.